Although it is believed that Thomas Garway (or Garraway) first served tea in his coffee house in London in about 1658 it did not become widely accepted until after the 'Restoration' when it was popularised by Catherine of Braganza, who brought the tea drinking habit with her from the continent. Tea drinking in the 17th century appears to have continued in Coffee Houses and, although something is known about these coffee houses and who frequented them, very little is known about how it was served or how it was kept in the commercial quantities necessary for trade. The first intimation we have of tea drinking as a social habit carried on in the home is at the end of the 17th century and at this juncture some container for keeping tea in the home would have become necessary although, to the best of this author’s understanding, there are no 17th century tea caddies known. The name is taken from the Malay word ‘kati’ which was a specific unit of weight used for measuring tea but not related in any way to the amount an English caddy would hold. The earliest tea caddy known to this author was made by Thomas Ash and is dated 1708 but it was not until the reign of George I (1714 - 1727) that silversmiths began making these containers in sufficient quantity that examples can readily be found today. These early tea caddies were of fairly simple construction and design, taking a bottle-like form with straight sides, shoulders and a narrow neck with a pull off cap. Apart from engraved armorials these caddies usually have no decoration except, sometimes, for the finial surmounting the cap. It has been ascertained from pictorial representations of early 18th century tea drinking that this cap was used to dispense the tea into the pot. Tea was a very expensive commodity in the 18th century and was heavily taxed. By the middle of the century the tax imposed on tea was 119% and it became necessary to devise a method of preventing theft. Lockable wooden boxes, some quite ornately decorated, were produced in which a pair of caddies could be kept securely. These boxes were in use by the reign of Geo II as can be seen from the following: "Advice To The Waiting Maid" in the publication Directions to Servants by Jonathan Swift and published in 1745. He makes the observation; "the Invention of small Chests and Trunks, with Lock and Key, wherein they keep the Tea and Sugar, without which it is impossible for the Waiting maid to live......". It should be noted that some experts make the claim that the central compartment or container in these boxes was for blending the teas. However, although there is evidence that Thomas Twining, one of the earliest purveyors of loose tea, was blending tea as early as the reign of George I, there is no evidence that it was blended at the table and the above extract from Swift's "Directions to Servants" shows quite clearly that the third container was for sugar. Caddies were being made in pairs because by the end of the 17th century not only Hyson (green) tea was being imported from China but also Bohey (black) tea and it was considered desirable to have both on offer at the tea table. Sometimes caddies were engraved with the letter 'H' on one and the letter 'B' on the other so that the same sort of tea was always kept in the same caddy. The design of these mid 18th century tea caddies was beginning to follow contemporary fashion so that the bombé shape is common, and some are ornately decorated in the rococo style while others, as in the case of those illustrated here, relied on engraving for their decoration. 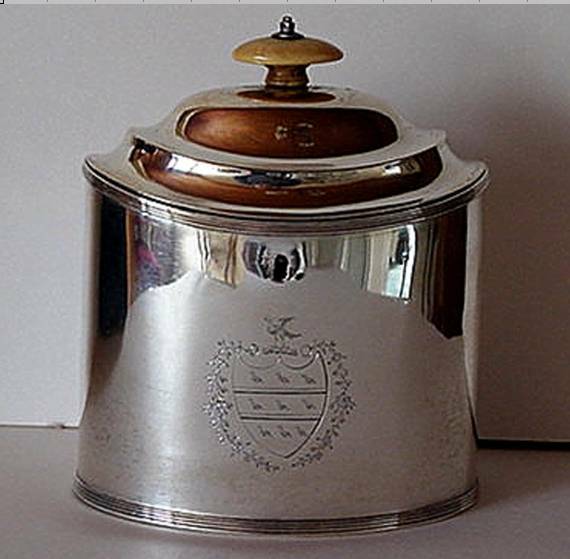 By this date the narrow neck has been replaced by a hinged or lift off lid so that some way of transferring the tea from the caddy to the pot was necessary. Teaspoons had been introduced by the end of the 17th century and it must be assumed that these were used as 'caddy spoons' since the spoon specially designed for this purpose was not made until the seventeen seventies. 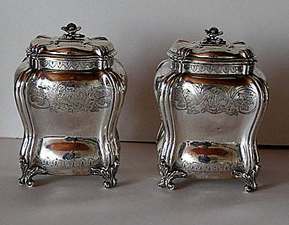 Some of the boxes made to contain a pair of caddies were, as can be seen in the above quotation from Jonathan Swift, also provided with a glass bowl in which sugar, which was also an expensive commodity, was kept and occasionally a set of three matching silver containers can be found showing that sugar was considered an essential part of the tea drinking ceremony by this date. 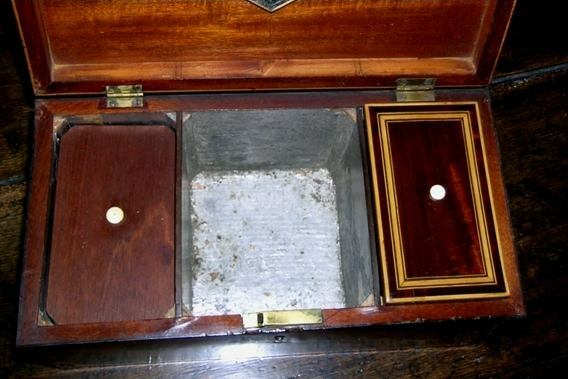 Although these wooden boxes continued to be made well into the 19th century and beyond, by the end of the 18th century silver caddies were produced to stand on their own and these were equipped with their own locks. These caddies are usually decorated in the fashion of the time with quite ornate brightcut engraving although some, like the one illustrated here, are quite plain. As these caddies have locks, lift off lids are less common at this date and hinged lids with quite large finials are usual. By the time these caddies were being produced the caddy spoon had been invented and these were often made en suite with the caddy. They can be quite pretty and are collected in their own right. 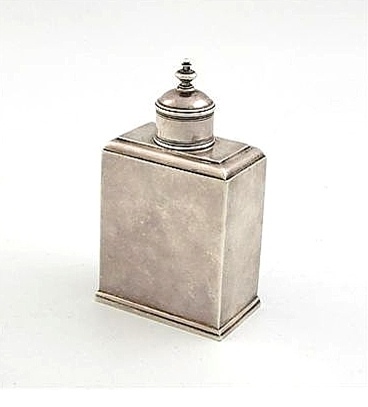 During the 19th century silver tea caddies fell out of vogue and the wooden boxes were produced with zinc lined compartments in which the tea could be stored. Silver tea caddies were mostly, therefore, an 18th century phenomenon but are an interesting part of English tea drinking history. (left) 19th century tea caddy showing the central compartment for sugar. The right hand tea compartment is shown with its decorative lid in place whilst the left hand compartment is shown with its inner preserving lid in place. This secondary lid is close fitting and rested on the tea to keep the air out thus keeping it dry.